Salty ocean breezes and plenty of warm South Carolina sunshine are just the beginning at A Place at the Beach VI. This oceanfront resort is teeming with conveniences and located in exciting North Myrtle Beach, South Carolina. The North Myrtle Beach area is the premier vacation destination in beautiful South Carolina. You can spend your days in North Myrtle Beach shopping at local boutiques, shopping centers, the outlet mall and specialty stores that feature beach and resort wear. When you and your family stay at A Place at the Beach VI, you will be vacationing in a comfortable condo rental with a fantastic location. These delightful North Myrtle Beach condos have many of the comforts you want in a beach rental. A Place at the Beach VI features condo rentals with conveniences such as window air conditioners to keep you cool on the sunniest of days. You can book your stay in a condo rental where you will have stunning views of the beach and turquoise water of the Atlantic Ocean and also keep the rental at the perfect temperature for you and your family when you are at A Place at the Beach VI in North Myrtle Beach, South Carolina. Dining with your family is a great way to catch up and really connect with your loved ones. Sharing a meal with the people you love is a wonderful opportunity for you and your family to spend quality time together and you will have every opportunity to sit down to a delicious meal when you vacation at this casual North Myrtle Beach resort. Prepare fresh and tasty meals in your appealing North Myrtle Beach condo and treat your family to the high-quality, homemade meals they are accustomed to. 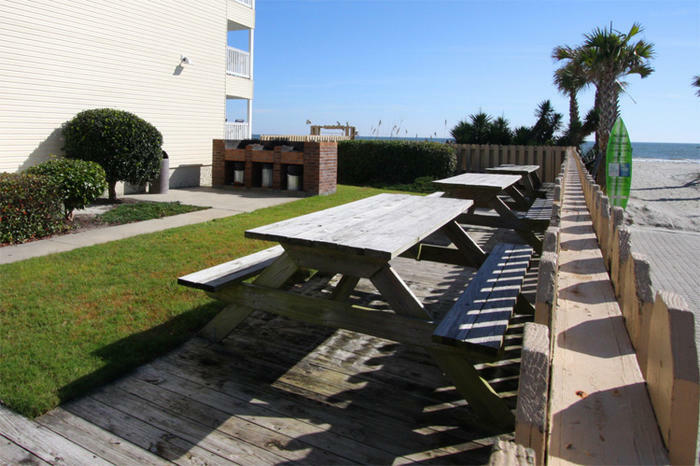 This restful North Myrtle Beach resort has picnic tables where you and your family can dine alfresco and enjoy the breathtaking views and gorgeous South Carolina weather. You can expect many other conveniences when you choose A Place at the Beach VI for your long-awaited North Myrtle Beach vacation. This stylish resort has condo rentals with washing machines and clothes dryers you can use to keep your clothes, bathing suits and beach towels fresh and ready for your next outing. Trips to the Laundromat are so boring and a total waste of your precious little vacation time so stay and play where you can relax in one room of your beach rental while your laundry is washing in another. Elliott Beach Rentals is not affiliated with onsite management or the HOA of A Place At The Beach Vi.